So, you’ve been nominated to plan somebody’s retirement party. And, even worse, you’ve been asked to give the retirement speech. How, you’re thinking, can I summarise a valued staff member’s contribution to my workplace in a single speech? Never fear! We have collated some fantastic speech-making tips that will help you get through this. If you’re not a confident public speaker, make sure you jot down some notes beforehand. List the main topics you want to cover using bullet points, rather than writing out the entire speech word-for-word. This way, you’ll ensure you get through everything you wanted to say, but you won’t be tempted to just read the speech out to your audience. You could even practise performing your speech in front of a mirror or to family members and ask them for feedback. We also recommend you keep your content cheerful; don’t focus on the fact that this is the “end of an era” for your departing employer or fellow employee. Instead, encourage them to think of it as the beginning of a new, exciting phase in their life. Putting some humour into your speech – reciting a funny anecdote involving your guest of honour, for instance – is a great way to boost your confidence while speaking, as well as get your audience to relax and enjoy your speech. You could also try reciting a poem if you’re stuck for speech content. Typing “retirement poems” into Google comes up with a surprising number of hits. 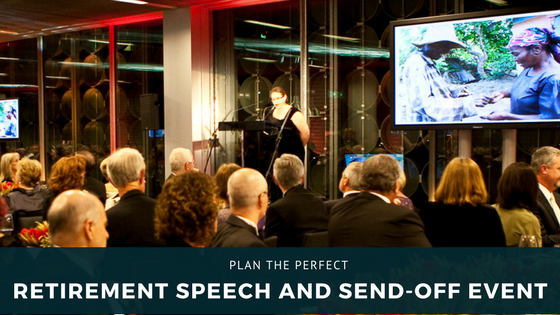 A PowerPoint presentation including photos of the guest of honour could complement your speech. It will avert your audience’s gaze from your face every once in a while and keep them entertained while you speak. To help you plan the send off event, we offer the latest projectors to ensure your slideshow is not only visible to everyone in the room but also professional-looking. And, to make sure everyone in the room can hear your magnificent speech, we also provide state-of-the-art audio systems for large and small events. Pro Light & Sound can provide your company with the audio and visual services you need to give that special employee the farewell bash they deserve.